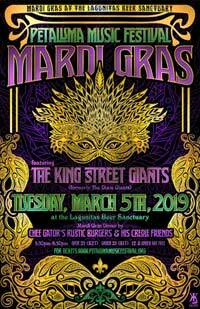 Petaluma, CA- Let the good times roll yet again for the Petaluma Music Festival’s 6th Annual Mardi Gras Party on Fat Tuesday, March 5th at the Lagunitas Beer Sanctuary (5:30 to 8:30 PM). Come celebrate this Sonoma County tradition! The King Street Giants (formerly the Dixie Giants) will have you up and dancing with their infectious energy and second line groove, and we are very pleased to have Chef Gator’s Rustic Burgers & His Creole Friends providing delicious chicken & Cajun sausage jambalaya, red beans & rice, cornbread, and pineapple jalapeño slaw! Tickets include dinner and are only $27 for adults over 21, $17 for teens (13 to 20), and kids 12 and under are free. It’s a benefit for the Petaluma Music Festival, so come out to celebrate and help keep music in our schools. Tickets available online by clicking here or at the door. All proceeds benefit the music programs in all Petaluma area public schools!